His Grace Bishop Hovakim Manukyan (baptismal name Vardkes) was born on October 19, 1976, in the village Voskehat, Republic of Armenia. He received his primary education at the secondary school of the village starting in 1983 and graduating in 1993. He entered the Vaskenian Theological Academy at Lake Seven in 1994 and 1999 transferred to the Gevorkian Theological Seminary at the Mother See of Holy Etchmiadzin and graduated in 2000. He also took a course at the Bossey Ecumenical School, Geneva, Switzerland in 1998 and a course in Social Theology at the Diaconal School in Aarhus, Denmark in 2001. He was ordained to the diaconate on July 16, 2000, by His Eminence Archbishop Mesrop Grigorian. Upon his graduation in 2000, he was assigned to serve in the Inter Church Relations Department of the Armenian Church. On October 22, 2001 he successfully defended his thesis entitled “Extracts from the History of the Coptic Orthodox Church ” and received a mark of very good. On November 11, 2001 he was ordained as a celibate priest, by His Eminence Archbishop Voskan Galpakian. From 2002-2004, he studied at the Spiritual Academy in Sergiev Posad, Moscow and received a Theological PhD degree. Since 2004 he was reappointed to serve in the Inter Church Department of the Mother See. He was appointed to serve as the Director of the Inter Church Office in August, 2005. 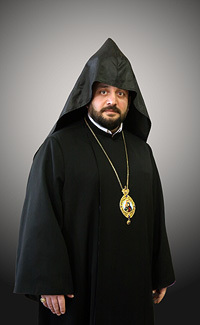 On April 21, 2006 he presented and successfully defended his doctoral thesis entitled “Ecumenism in the 20th Century and the Armenian Church” and on April 23, 2006 received the rank of Archimandrite (Vardapet) at the St. Mesrop church of Oshakan by His Eminence Archbishop Yeznik Petrosian. From 2008-2009 he attended classes at the Yerevan University School of Political Studies. In 2010, he received his ordination and consecration as a Bishop by His Holiness Karekin II, Supreme Patriarch and Catholicos of All Armenians. Since 2005 he has served as member of the Trustee Committee of the Armenian Round Table Charitable Foundation. He served as a member of the Church and Society Commission of the Conference of European Churches (CEC) from 2004 to 2009. He was appointed to serve as a member of the Central Committee of the CEC in 2009. Since 2004, he has served as the Ecumenical Officer of the Armenian Church to the World Council of Churches. Since 2004, he is a member of the Ecumenical officials. In 2006, participated in the 9th WCC Assembly held in Porto Alegre, Brazil, in 2007 at the third European Ecumenical Assembly in Sibiu, Romania, and in 2009 at the 13th Assembly of the Conference of European Churches in Lyon. In 2010, he was a member of the delegation for the Catholicos of All Armenia’s visit to Baku and in 2011 a member of the delegation for the Catholicos of All Armenia’s visit to Georgia. From 2014 to 2015, he accompanied His Holiness during his visits to the Vatican. In 2013 he was the delegation member of Catholicos of All Armenians during the 10th Conference of the World Council of Churches in Busan. He was the Primate of the Diocese of Artik and the Director of the Ecumenical Relations Department from 2012 to 2015. On July 15, 2015 he was appointed to serve as the Primate of the Armenian Diocese of Great Britain. If you have any questions or suggestions, or wish to help as a volunteer or in any capacity, I would be delighted to hear from you.